Costs – Find out what local Providence tree owners pay for removal and maintenance services by professionals. FAQs – What do you know about the tree culture in Providence? Services – Get a pro out to your home immediately for the tree work you need done. How Much Do Tree Services Cost in Providence? Providence, Rhode Island homeowners will face several different costs when it comes to proper care and maintenance of their trees and shrubs. Prices tend to rise according to the complexity of the job or the amount of trees and shrubs that require attention. Removal costs can run a bit higher than maintenance costs, running between $640 and $900. Several factors will play into the final price. Tall trees, particularly ones that interfere with electric lines, can cost substantially more to remove. Trees and shrubs with difficult branch patterns or deep root systems will also be more expensive. Another factor that can drive up costs is a large amount of wood and branches that will need to be hauled away. Stump removal is another expense that homeowners should factor separately, which can cost between $80 and $150. The price should include the cost of equipment and material plus cleanup and removal of debris. To grind one medium to large sized stump, it will take a crew about two hours worth of labor, including setup times. Maintenance services include trimming problem branches, pruning shrubs for health and proper form, fertilization, and control of pests and disease. Homeowners in Providence should expect to pay between $390 and $580 for tree maintenance services. Providence has certain rules and regulations that all homeowners should be aware of before they proceed with cutting down and replacing trees in the city. Likewise, there are specific trees to known about before choosing ones to plant in your yard. It’s best to know all of these issues ahead of time before you pay for repairs to the home or the yard because of tree issues down the road. Learn more about the tree culture in Providence so you’re well-informed going into tree-planting and care season. Providence has a zoning ordinance that protects any trees that are 32 inches in diameter or larger, whether they are on public or private property. Permission must be granted by the City Forester in order to remove these or any other significant trees, and there must be sufficient reason for removal. Some reasons for removal include trees that pose a threat to structures or people, trees that are growing into underground utility lines and trees that are creating a hazard by buckling streets or sidewalks. The City Forester is also legally allowed to remove trees from private property at any time if they are presenting a health and safety threat to other trees or to people. Trees and shrubs can be removed at any time of the year, particularly if they are posing some type of hazard. For trees that are not a threat, many Providence homeowners prefer to cut them down in the winter for a couple of reasons. During the winter, with frozen ground, it can be easier for workmen and vehicles to navigate a job site. It is also the time when there is the least amount of sap flow, meaning that felled wood will be ready to be used as firewood much faster. When it comes to trimming and pruning, the best time is late fall or early winter. This will give the tree or shrub plenty of time to energize for a large amount of new growth in the spring. Which Trees can Cause Problems for Providence Homeowners? Sweetgum trees can prove troublesome in Providence for two reasons. Roots are prone to cracking sidewalks, and the spiny fruit it drops each fall can injure the feet of children or pets. Some varieties of honey locust can also be a serious problem as the branches and even the trunk can become covered in thousands of long, sharp thorns. Cottonwood trees are another species to avoid. Homeowners complain of sticky, sap-filled pods coating vehicles, decks and more. These trees also lead to a lot of cleanup because they shed twigs constantly. 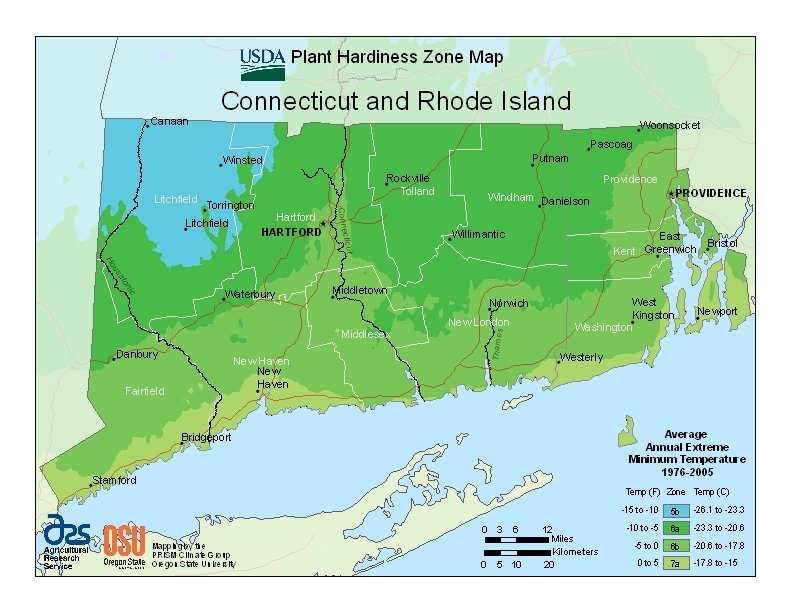 A comprehensive list of native Rhode Island trees and shrubs can be found here. Rhode Island adopted the red maple (Acer rubrum) as the state tree in 1964. 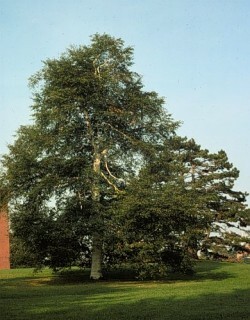 Today, it is one of the most popular landscape tree species. Homeowners love the dense shade it provides as well as the gorgeous red fall foliage. It is also a good sap tree for those interested in making their own maple syrup. Some of the tallest trees are the shagbark hickory and the white pine, topping off at more than 80 feet. The American holly stays small at approximately 15 feet in the northern end of its range. Flowering dogwoods will also be on the shorter side, particularly if they are planted in shade. A number of fruit trees can be grown in Providence. Apples are the most popular choice, but homeowners can also grow peaches, cherries, pears, plums and more. Tropical fruits like bananas or oranges will not survive, but Rhode Islanders have access to some interesting native fruit trees and shrubs like huckleberries and cranberries. In Rhode Island, two of the most common pests are the gypsy moth and the hemlock woolly adelgid. The woolly adelgid has been causing high mortality rates among eastern hemlock trees while gypsy moths are responsible for vast amounts of defoliation, leading to extensive tree loss. There are several diseases that can affect trees in Providence. The most notable include Dutch elm disease, beech bark disease, red pine scale, butternut canker and dogwood anthracnose. Be on the lookout for signs of disease such as unusual bark patterns or scaling, abscess-like lumps on branches, spotted or wilting leaves and other unusual conditions that seem to appear for no reason. Diseased trees should be treated or removed promptly for the health and safety of neighboring trees and shrubs.